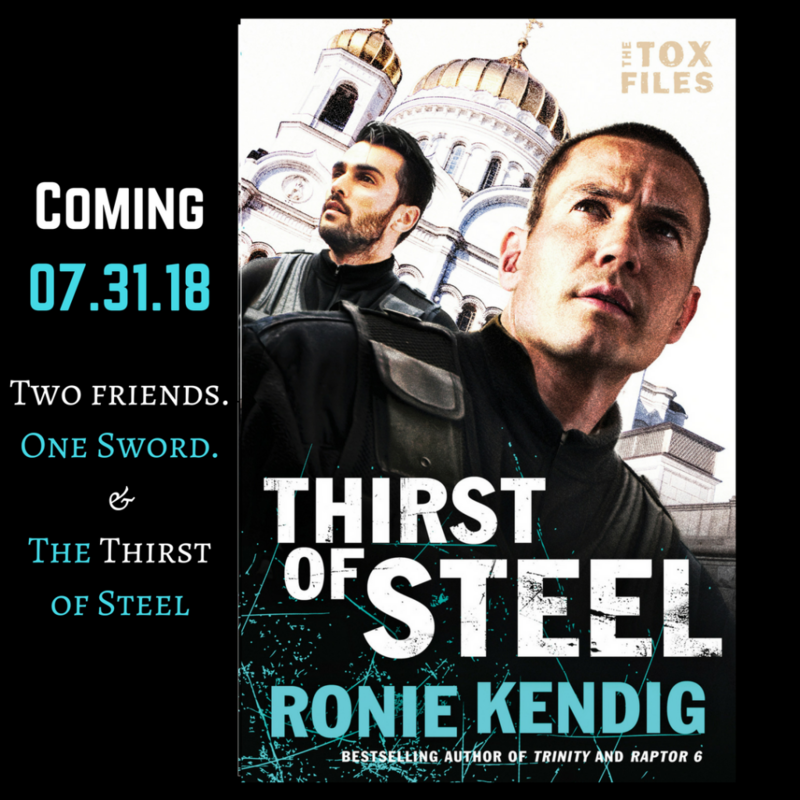 I am beyond thrilled to share with you loyal Rapid-Fire Fiction Readers this amazing cover for the THIRST OF STEEL, book 3 in The Tox Files! And don’t forget the giveaway widget below the image!! What’s that you say? Most of the image below is blacked out? Well, Wraith would never expose their location before the time was right. So stay tuned…this block will fill over the day as the cover is revealed on INSTAGRAM. And guess what? You can PRE-ORDER THIRST OF STEEL right now, so you don’t miss this explosive conclusion to The Tox Files! The AFO, however, is determined to claim the sword. Wielding their father’s life over Tzivia and Ram Khalon, the AFO threatens to expose Ram’s long-held and dangerous secret while demanding Tzivia locate the sword. With the Wraith team slowly being torn apart, things only worsen when Mercy Maddox, a new operative, emerges with the stunning news that the sword is tied to both Ram’s secret and a string of unsolved serial murders. Tox, Ram, and the others are forced to set aside fear and anger to focus on the enemy. No matter the cost, Wraith must stop the enemy down or go down with them. And don’t forget this giveaway!! A patriotic cozy (book sleeve) by the crazy-talented STEFFANI WEBB, but also a CROWN OF SOULS bookmark and bangle. Thank you, Danie!! That is so encouraging!! Preordering this book today. Am so excited and yet a little sad thinking that this might be the last book about Tom and his team. They have become like friends that I want to keep close. Thanking the Lord for your wonderful gift of bringing these people to life. Looking forward to the next adventure. I know that sadness, Cindy! I feel it, too! Thank you for your sweet words!! I can’t wait to read this newest installment. I can’t wait! Am I too into this Military action? I find myself thinking that “The wall around that hotel patio is too low. Vulnerable. ” Another day while driving back to our temporary home I pull onto the freeway, right behind a large white truck with RAM emblazoned on the back & I think, “Oh, Ram, what are you doing here? ” Love being so engrossed! Awww, that’s so awesome. Love it!! Thanks for sharing, Mary! I have no idea who might share the cover, but I love your books, and this premise sounds fascinating. Can’t wait to read it! I’m going to guess Haven will be on the cover, too! 🙂 I really like the blue tone, too. I am so excited for TOS! I’m loving the cover the so far and hoping it’s Ram in the cover. So ready for some more of Ram and Tzivia’s story. I hope it’s Ram……my favorite!!! I just discovered you!! Thanks to Carrie and Rel. I’m reading Conspiracy of Silence right now and Loving it!!! Hooah!! I must thank those friends for sharing and drawing you onto the team!! Is it Ram with Tox on the cover? This is so exciting!!! I love your books! I CANNOT WAIT!!! OMGOSH THE COVER IS BEAUTIFUL! I can’t wait to read this!! And is that Ram sharing cover space?! Totally in love with this series. Who is the cover model? Can we all say “swoony”??? RAM!!!! GAH!!! I CAN’T EVEN. Oh, I love this cover. It’s going to be SOOOO hard to wait until July to read this. I’m anxious to read more about Ram and his secret. Great cover! I just discovered your books, so I’m in for a real treat; having lots of Ronie Kendig books in my future. Yessss! Welcome to the team!! I have no idea who is taking the limelight away from Tox! Ahhhh i love that cover model! My brain and heart are already humming in anticipation! Tox and more of Ram…..what a great combo! And who is this Mercy?!?! You already know how I feel about your writing, but I also love how smart you are about the business of your books! I wish you the very best with your recent contract and sales of your novels! Thank you, sir! It’s hard work, but I’m in it for the long haul. And I LOVE my readers!! Can’t wait to go on another mission with Cole. He may be toxic to some but for me there is no better guy to have your six. He’s the real deal! Plus, He deserves a great life with Haven. I can’t wait for this next book. And I am excited about you new series. AAAAH!!!!!!!!!!!!!!!! I adore this cover. Such a tease with Ram on there! And the preview of the book on your blog….EEP! I am beyond excited about this next book. I refuse to consider that it is the end of the series. The cover is FANTASTIC! So glad we can see both Tox and Ram. I was hoping for Cell, but I understand. Please tell me he will be in this book? His humor was great in the other books. Have a great day! Thanks for sharing the cover! I love your books!! Can’t wait to read it. I can’t wait!!! I love all of your books! Keep them coming! OOh, I love this cover and am very curious as to the location hinted at by the building in the background. I think this is your best series yet. Obviously I need to change my guess…. IT’S RAM! Hooah!!! It looks awesome, can’t wait for next summer! I would say it has be to Ram on the cover with Tox. I was going to say Ram even before I saw your reply to someone else! Just got Crown of Souls!! Would love to win these. Wonderful cover. I like the new series; however, I’m having to read through it more slowly than your other wonderful books. I don’t have any previous knowledge of the adventures Tox and his team have been on, so trying to make sure I grasp the concepts and what’s going on is slowing me down a bit. But that’s okay…makes the book last longer. 🙂 Cell’s my favorite in this series; I love his personality. He reminds me of Canyon and Hawk! I’ve read every book you’ve written. God has blessed you with a tremendous gift and I’m so grateful that you’re sharing it with the world of readers! Just finished “Crown of Souls” about five minutes ago. SIGH. On page 378 it finally dawned on me that there was going to be a third book. Part of me rejoiced and part of me cried, “no!” Now we have something to look forward to next year! I am loving the Tox Files series. I can’t wait for the next book. Thank-you for writing these amazing adventures! My only complaint is that is has to be a trilogy… I miss the days of 10+ books in a series. I’m not ready to say goodbye to Tox, Haven, and the team! Any chance on a book #4? am so excited for TOS! I’m loving the cover the so far and hoping it’s Ram in the cover. So ready for some more of Ram and Tzivia’s story.